Finance constitutes the core of the G20, which started as a finance ministers’ meeting in 1997. Innovation and the digital economy are relatively new themes at the G20. The first innovation theme was adopted by the Think 20 Turkey in 2015; innovation became a priority of the Chinese G20 Presidency in 2016, and Germany brought the digital economy ministers together for the first time in 2017. Now it is time to bring these old and new themes together, and turn the G20 into a premier policy discussion forum around Fintech, which refers to technology-enabled innovation that transforms financial services. A G20 discussion around fintech is needed because of the emergence of global technology giants as data intermediaries, expanding into the financial services industry, resulting in regulatory risks and challenges. The panel on Fintech at the official Think20 Mumbai Roundtable, organised by Gateway House on 28 January 2019, could not be more timely. There are two dimensions to technology in finance: Fintech and Techfin. While the abovementioned definition of fintech refers to fintech as an activity, Fintech as an entity means “a non-bank institution that uses advanced technologies to perform traditional banking activities”. These are usually startups, begun around consumer pain points in the financial services industry. Techfin refers to a company that starts with collecting consumer data for resolving a consumer pain point in a non-financial area and then utilising the same data to move into financial services. Fintechs are financial intermediaries, whereas Techfins are data intermediaries.Techfins include American big-tech companies, such as Apple, Amazon, Microsoft, Google, Facebook, new unicorns like Uber, as well as Chinese big-tech, such as Alibaba, Tencent, and Baidu. Ant Financial, the financial services arm of Alibaba, reached a valuation of $150 billion—on a par with Unilever or Pepsi—in 2018 by building its services on the e-commerce data of its parent company. That said, the backbone of the global financial system is still the regular bank. An important principle under which banks operate is “territoriality”. Although many banks have cross-border investments, each of the national units is regulated locally. Banks are the major tools through which monetary and macroprudential policy-making is conducted. In contrast, Techfins generally act as if “they are on par with, not subordinate to, the countries that try to regulate them” and in a sense provide a global neutral environment to their users. They are sometimes called “Digital Switzerlands”. The power of Techfins stem from the trust they create in other consumer industries on which they collect vast amounts of consumer data. Amazon, for example, is the second-most trusted institution in the United States, after the military. In contrast, popular trust in the banking system is so low that in June 2018, Switzerland’s electorate voted on a referendum calling for the country’s commercial banks to be banned from creating money. Although the outcome was negative, even the fact that the central pillar of modern macroeconomic policy was being questioned by the electorate in one of the most important banking hubs of the world is telling. Techfins can increasingly make it harder to conduct financial policy-making and increase the financial risks, especially for the countries they are born in. Fintechs, instead of building business models based on existing data repositories, generally start with customer pain points in a nation. Instead of transferring trust from another industry’s customer relations, Fintechs build trust by solving customer problems – usually creating totally new markets that have not been served by the banks so far and creating platforms for other entrepreneurs to tap and grow. This is true in emerging markets inasmuch as, and probably even more than, in advanced markets. One example, iyzico, is a payment services company in Turkey. By offering payment services to entrepreneurs who cannot get access to traditional solutions offered by the banks, iyzico created a success story in financial inclusion. Small- and medium-sized businesses that use iyzico, on average, have grown 77% in size since 2016. The exports over iyzico have grown nine times larger than Turkey’s average e-exports, and reach on average a distance of 60% away from its home base. Fintechs provide a wide range of services to customers that traditionally a bank undertakes – usually in a more innovative and customer-centric fashion and by making better use of technology-enabled innovation. 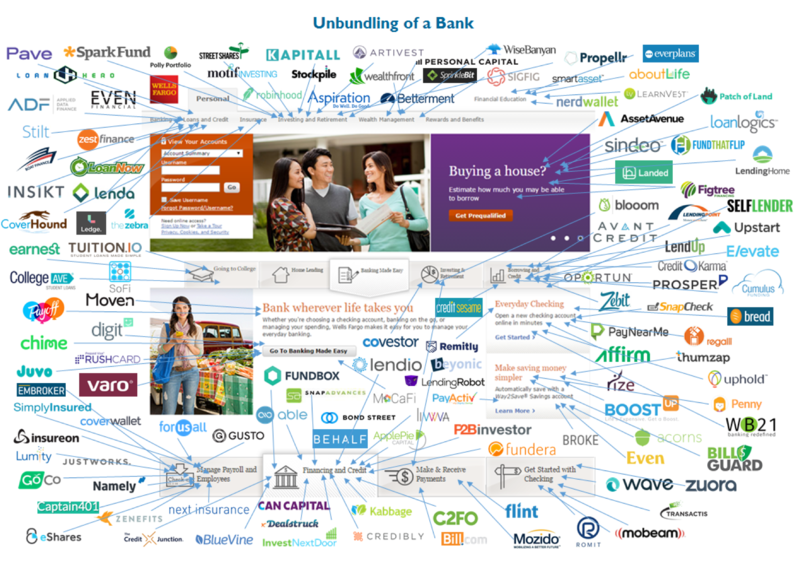 This is sometimes called “unbundling of a bank” as illustrated in the figure above. This is why banks generally perceive Fintechs as competitors. Nevertheless, banks have some of the most traditional institutional structures, putting procedures ahead of consumer pain points, and data and ideas inside silos of different departments. It is unlikely that they can win the race of financial innovation with the Techfins. One way for the banks to stay ahead of the curve is, instead of approaching Fintechs as competitors, to explore ways of cooperating with them to foster innovation. Such a strategy would be a win for Fintechs as well, by providing them access to customer scale, brand reputation and domain expertise. Some banks are already pioneers in collaborating with Fintechs. For instance, Bank Santander, which is based in Spain with a significant amount of operations in emerging markets, invests in Fintech companies, including Ripple, a blockchain-based global financial settlement platform, and Kabbage, a leading automated credit provider to SMEs. Discuss optimal regulatory principles that will enable banks and Fintechs to work together.The new version of the Payment Services Directive in the EU (PSD2) is a case in point. It obliges banks to provide open access to their data, use transparent pricing schemes and avoid price discrimination in the infrastructure services they provide. Discuss optimal structures to improve mutual learning for Fintech regulatory sandboxes. It is usually not possible to experiment with new Fintech products under the regulations established for the traditional banks. Without the learning from experimentation, innovation becomes limited. Regulatory sandboxes, which now exist in more than 20 jurisdictions around the world, enable Fintechs to conduct certain transactions and services within defined threshold limits, while full compliance is ensured once the testing is completed and the business becomes more established. Establish a forum to identify best practices around government-led infrastructure investments for the development of Fintechs. One such infrastructure is digital identification, which enables electronic know-your-customer applications or payment applications through ID cards. For example, India’s Aadhaar system provided digital identification to 1.2 billion people. The privacy and ethical issues should also constitute a part of the G20 discussion around government-led interventions. Another relevant infrastructure is Legal Entity Identifier (LEI), a unique global code for legal entities to increase financial stability by tracking the beneficial ownership of companies, mandated by the G20 Cannes Summit of 2011. The privacy and ethical issues should also constitute a part of the G20 discussion around government-led interventions. Ussal Sahbaz is Chief Executive Officer, Centre for Economics and Foreign Policy Studies (EDAM). OECD (2017). Fintechs and the Financial Side of Global Value Chains. Dirk Zetzsche, Ross Buckley, Douglas Arner, and Janos Nathan Barberis (2017), “From FinTech to TechFin: The Regulatory Challenges of Data-Driven Finance,” European Banking Institute Working Paper No. 6. Bromberg, Lev, Andrew Godwin and Ian Ramsay (2017). Fintech sandboxes: Achieving a balance between regulation and innovation. Journal of Banking and Finance Law and Practice, Vol.28, No. 4, pp. 314‐336.